"A gripping, emotional, and thought-provoking novel that explores unresolved issues of race, gender, and sexual orientation; provokes the reader to explore deeply sociological issues and to come away with a deeper understanding and acceptance of the differences that define us. An absorbing, important book that should not be missed!" The Columbia Review. 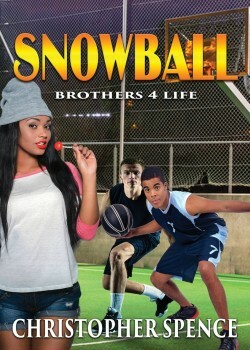 “Snowball – Brothers 4 Life” by Christopher Spence is a coming of age/coming out novel that explores the unique yet universal young adult experience. It successfully weaves deeply important societal issues (homophobia, racism, mental health) in an engaging and thought-provoking read. The book follows the lives of Jake Bradley, who is the star point guard for the undefeated Westside Academy, and his best friend Mac. Jake and Mac, teammates and “brothers for life,” have long been nearly inseparable and are incredibly close both on and off the court. But their relationship is challenged when Jake begins to develop romantic feelings for Mac’s sister, Willow, and Mac has a shocking revelation that suddenly renders him an outsider. The basketball court becomes a metaphor for life in this gripping, emotional, and thought-provoking novel that explores unresolved issues of race, gender, and sexual orientation. The characters’ struggles to re-conceptualize all that they thought they knew about life, family, and friendship provoke the reader to explore these deeply sociological issues and to come away with a deeper understanding and acceptance of the differences that define us. An absorbing, important book that should not be missed!